Solid blocks of rich Wockenfuss chocolate, great for cooking or just for munching. Milk Ingredients: Milk Chocolate [Sugar, Milk, Cocoa Butter, Chocolate Liquor, Soy Lecithin (an emulsifier) and Vanillin (artificial flavor)]. 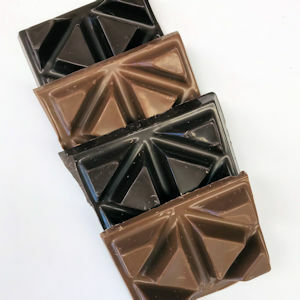 Dark Ingredients: Dark Chocolate [Sugar, Chocolate Liquor (processed with alkali), Cocoa Butter, Milk Fat, Soy Lecithin (an emulsifier), Vanillin and Natural Flavors].